I'm pretty far from what you might call an avid gamer (games I've played in the last five years: Portal, Machinarium, Tales of Monkey Island, Botanicula, and, uh, that's it; I still haven't gotten around to Portal 2), but even I couldn't miss the attention paid to The Fullbright Company's Gone Home. Part of the reason that I ended up playing Gone Home--aside from the fact that it doesn't require shooting anyone or terrific hand-eye coordination--was that it was a game that people seemed to be seriously discussing and debating. Having played the game myself, however, I found my own eagerness to join the conversation curtailed by this blog's spoiler policy. Which is: a) that I don't have one, b) that I am sick and tired of the way that the word spoiler has been allowed to control and denature the discussion of pop culture, and c) that any worthwhile piece of fiction is one that can't be "spoiled" by knowing what happens in it. Gone Home, however, is a work that challenges that last belief. Its effect is rooted in the expectations it creates in its audience, and a player who goes into it knowing what to expect will probably get much less out of it than someone who goes in completely ignorant. And, unfortunately, I can't in all good faith urge you to buy the game and play it, since for all that it is interesting and worth playing, Gone Home doesn't really justify its $20 price tag. I don't doubt that the price reflects the cost of making the game--whose graphics, gameplay and voice work are all top-notch--and I see the value of encouraging independent game developers, but none of that changes the fact that Gone Home takes maybe three hours to get through and has almost no replayability value. So, I leave it with you: Gone Home is overpriced, extremely interesting and worth playing, and if you read the rest of this post before playing it you probably won't enjoy it as much as I did. Your call. Gone Home takes place over a single night in June 1995. The player character is twenty-year-old Katie Greenbriar, who is returning home after a year backpacking in Europe. Once she gets into the house, Katie discovers that her family--parents Terry and Janice, and younger sister Sam, who has left Katie a cryptic and urgent note telling her not to worry but also not to look for her--are missing. The game consists of directing Katie through the house (actually a mansion), and discovering, through documents, letters, and journals entries belonging to the three family members, what has happened to the Greenbriars in the year that Katie's been away, and where they've all gone. Through these documents, the player discovers that the family has only moved into the house, which originally belonged to Terry's reclusive uncle Oscar, in the last year (adding an extra level of meaning to the wordplay in the game's title, since Katie is returning to a home she's never been to), and that in that time both parents have gone through a crisis. Terry, a failed science fiction writer who now writes electronics reviews, has started drinking heavily, while Janice has struck up a flirtation with a colleague at her job in the forestry service. The bulk of the game, however, is taken up with Sam's experiences, which are also related through journal entries directed to Katie and read by actress Sarah Robertson, as she finds herself first the odd man out in her new school, and then befriends an older girl named Lonnie, with whom she shares a love of the punk aesthetic and riot grrl music. Over the course of the year Sam and Lonnie's friendship deepens and becomes a romance, which is overshadowed by the fact that Lonnie is planning to join the army after graduation. Much has been written about the way that Gone Home takes advantage of its players' reading protocols to achieve its effect. This is, after all, a game in which you explore a strange, dark, (apparently) empty mansion whose previous owner died in it, in the middle of the night, in a thunderstorm. Specific moments in the game are clearly designed to create expectations of a horror narrative. Almost every review of the game, for example, will note the moment in which the player explores one of the mansion's secret passages and picks up a wooden cross, only for the light bulb illuminating the passage to suddenly burn out and leave the player in pitch darkness. All the reviewers discussing this moment reported scurrying out of the passage as fast as their mouse clicks could carry them (I did the same thing), and this is clearly the response that the game's designers were hoping for. But the timing of the bulb's explosion turns out to be just a coincidence--one that the player is even prepared for when they find, in Terry's office, an electrician's report explaining that the house's old wiring will result in flickering lights and power surges. Because we're playing a game--and in particular, a game that is trying to recall other horror games in which creepy crawlies jump out at the player from the shadows (for me, this was The 7th Guest, a game that imprinted on me at a too-young age and which still has the power to send shivers down my spine)--we take this note as an indication of the kind of story we're in. 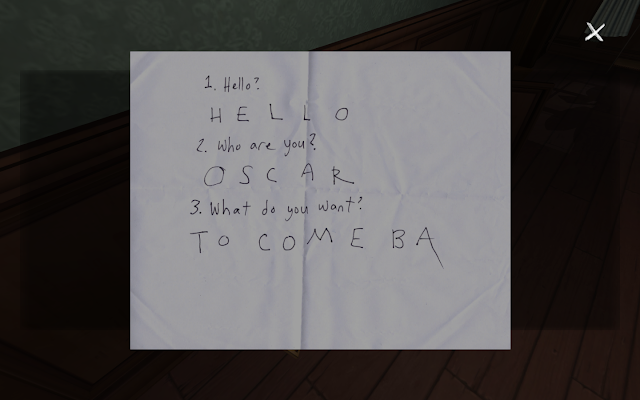 It's no coincidence that the note is discovered alongside the key to the house's previously locked basement--where lighting is particularly scarce (one room even remains completely dark, forcing the player to either abandon it or flail blindly for something to interact with), and where most of Oscar's belongings are stored. When we reach the end of the game, however, we realize that we should have looked at the note the way we would in real life, in which messages delivered by Ouija boards are the result of players unconsciously (or deliberately) moving the planchette. What's more, by the end of the game it's clear that if Sam had known the impression that the note had created in us, she would have been extremely bemused (it seems likely that she kept the note not because of its association with Oscar, but because she was playing with the Ouija board with Lonnie)--that Sam, in fact, had no idea of the impression created by her absence, her frantic notes to Katie, and the empty house. At the same time that it's using the conventions of games to achieve its effect, however, Gone Home is taking advantage of those same conventions to tell its story. The fact that Katie is a stranger in the house, for example, dovetails perfectly with the player's unfamiliarity with it. And being the player character in a game means that it's not at all strange for Katie to tear through her family's most private documents--including reading her mother's letters and rifling through her father's locked drawers. Though there is one moment in which Katie the character asserts herself over the player--when she finds a diary entry in which Sam describes her first sexual experience with Lonnie, and refuses to read it--for the most part Gone Home doesn't address how traumatic the experience of exposing her parents' faults and foibles would be for Katie (in fact, this is a seam of drama--young girl returns to an empty home, and, suspecting a terrible tragedy, uncovers a host of smaller tragedies that she wasn't ready to face yet--that the game's format isn't capable of exploring). Being a game, as well, means that Gone Home can expect its players to overlook some of its contrivances--that Janice has left letters in which she discusses a near-affair lying all over the house where her husband and teenage daughter could read them, that Terry hides a sensitive letter under the false bottom of a drawer in his desk in the same room in which he already has a locked file cabinet drawer, that Sam has locked Katie out of a wing of the house that includes the kitchen--which are necessary for the orderly progression of its narrative. Ultimately, Gone Home isn't a game so much as it is an interactive narrative pretending to be a game, and drawing much of its power from that category confusion. This goes beyond the genre confusion caused by the game's misleading use of horror tropes. The fact is, there really isn't any skill involved in playing Gone Home. Though it has puzzle-like aspects--certain parts of the house are locked and the player needs to find ways to get into them--these are solved not through intelligence or out of the box thinking but through sheer bloody-mindedness--by walking around the house, manipulating objects and reading documents until you find the path to the next part of the story. The primary skill necessary to play the game successfully is the ability to find the various lamps, string pulls and light switches that make the house navigable. What's more, there's nothing for the player character to do. By the time Katie shows up at the house, everything has already happened, and all that's left for her, and us, is to discover it. This is reflected in Katie's situation in-universe. Even once she discovers what's happened to her family--that Terry and Janice are on a couples' retreat, and that Sam, having learned that Lonnie got off the bus to basic training because she couldn't bear to be separated from Sam, has stolen some appliances for gas money and driven off to be with her--she's still trapped by a storm, with no car, and no phone numbers to call even if the phones are working. So what Gone Home actually is isn't a game, but a story, about how Katie arrived at an empty house, came to some horrifying and slightly ridiculous conclusions about what had happened to her family, and then learned that the truth is more mundane but also more fraught with complications. If you told this story as a piece of fiction, it would come off as anticlimactic, and maybe a little gimmicky (that's certainly the impression formed when I baldly lay out the game's plot in this post). But by turning the reader into a character, Gone Home invests its story with an emotional urgency that a straight telling couldn't have. It's not just that we're scared, worried, and fooled into imagining ridiculous things along with Katie, but that we're forced to participate in the story actively instead of consuming it passively. We're puzzling out the mystery with her, making choices that affect how she sees it (and overlooking clues and important items that could have changed her understanding of it). When Katie discovers Sam's diary entry from the day before the game's events, in which she describes her despondence over Lonnie leaving to join the army, saying "I just want to sleep," and her plan to go to her hideout in the attic (the last locked location in the house) "and wait," the expectations aroused--that Sam has committed suicide, or that Oscar's vengeful ghost has had its way with her--are faintly ridiculous even in the moment. But because it's left to us to find out the truth--because we control whether Katie unlocks the attic, whose key she finds next to Sam's diary entry, and can either delay that choice or rush to it--those ridiculous possibilities are invested with real weight, and the more mundane reality feels equally significant. Another way that Gone Home uses its game-ishness to breathe new life into a fairly simple story is the way that it uses the found documents format to give each member of the Greenbriar family (living and dead) a voice--and how each of those voices is expressed in a different way. Sam's voice is, quite literally, the most present in the game, and Robertson invests her diary entries, with their frankly rather by the numbers tale of self-discovery and sexual exploration, with genuine feeling. Her joy at discovering that she is seen and loved, and frustration at her parents' inability to do the same--when Sam comes out to Terry and Janice, their response is not to hear her, and to insist that she is simply going through "a phase"--are palpable. Katie, meanwhile, is the only active character in the game, but the one whose voice and personality are completely absent from it--all of her belongings are packed away in boxes (the sole exception, her high school athletic trophies which are on display in the foyer, seem to exist mainly for the contrast between them and the evidence of Sam's hobbies--making zines and recording Lonnie's band--which is hidden away in the house's secret passages), and the only examples of her writing are the vapid postcards she sent from her year away, in which one can sense Katie straining to say something new about some of the most written-about places in the world. The rest of the family, however, lies in an interesting zone between exposure and opaqueness, one largely determined by how thoroughly the player investigates their (ultimately, ancillary) stories. Janice, for example, has almost no voice--there are virtually no examples of her writing in the house. But her story is laid out almost step by step for the player to find--first a ticket stub to a concert, then a letter from her colleague Rick inviting her to use his spare ticket, then a hairdresser's bill for the day before the concert for more than $100, then a letter from Janice's friend Carol assuring her that Rick and his girlfriend can't be serious, then an invitation to Rick's wedding, and then a brochure for a couples' retreat--requiring our active participation in working it out. Terry, on the other hand, is loquacious--the game is full of his commercial, fictional, and personal writing--but throughout all of his writings he seems to struggling to say something that he can't express, and which he sometimes expresses in the wrong way--a letter from the editor of the technical magazine for which he reviews complains about the personal details that have begun creeping into his reviews. Oscar, meanwhile, is almost entirely absent, represented--out in the open at least--by newspaper clippings and business documents. And yet he looms over the game, first through Sam's joking evocation of his ghost, and later through a more tangible haunting of Terry. The three items that spell out the source of Oscar and Terry's turmoil--a letter from Oscar to Terry's mother, returned to sender, in which he apologizes for a "transgression," Oscar's will in which he leaves all his property to Terry, and a letter from Oscar to Terry congratulating him on his marriage, which Terry tore up and then sellotaped back together--are all hidden behind false panels or combination locks. It's unlikely that any but the most determined players will find all three in their first run through the game, and so the conclusion that most discussions of Gone Home have reached--that Oscar molested Terry as a child--remains opaque, expressed solely through Terry and Oscar's inability to express it. The same format that gives Gone Home its power, however, undermines it once the game is over, and our power to determine Katie's emotions and reactions is lost. The game ends when Katie finds Sam's final letter, explaining that she's gone off to be with Lonnie, and that the sisters will see other again "some day." Most reviews I've read of Gone Home have found this ending transcendentally happy and hopeful, a refutation of the trope of the miserable lesbian (as you'll recall, the game teases the possibility that Sam has killed herself out of heartbreak), and an affirmation of the ability of outsiders to find their own space and their own community where they can be accepted. While I can see that this was the game's intention (and agree that it's a laudable one) I'm not convinced that this is the story it's told. In the game's reality, what's actually happened is that Sam, who hasn't even finished high school, and Lonnie, who has just gone AWOL, are off on their own with only Sam's car and a few stolen VCRs to live off. It's hard to believe that this is going to end any other way than with Sam marched back home and Lonnie in jail (actually a pretty optimistic scenario in this situation, all things considered). And yet, precisely at the point where I deviated from how the narrative (and Sam) wanted me to feel, the game's interactivity shut down. After Katie finds Sam's last journal entry, the game ends with a hopeful reading from Robertson, and then allows the player to return and continue exploring the house (presumably to look for overlooked documents and hotspots). As noted, there's nothing that Katie can do, even if she feels--as I do--that Sam has behaved recklessly and selfishly. There's no space in the game for my feeling that Sam and Lonnie's romance, though very sweet, is far from the forever love that might justify their throwing away their lives for each other. (Not helping matters is the fact that Lonnie is probably the least persuasive character in the game, whose personality and interests seem crafted entirely in order to make her the perfect girlfriend for Sam--cool and edgy, but also completely in love with our heroine. The game even draws attention to the limits of Lonnie's construction when it has Sam point out her inherent contradictions--a punk lesbian who plans to join the army--but it doesn't resolve them in a way that makes Lonnie seem any less like a means to an end.) There's certainly no space to react negatively towards Sam for hurting her family--for example, stealing from Terry and Janice, which to me is just gross, and indicative of a child who still hasn't grasped that her parents are human beings deserving of respect, not walking ATMs (I was particularly bothered by the fact that Katie finds Terry and Janice's bedroom ransacked, the drawers pulled out and left hanging from their rails with no more consideration than you'd expect from a burglar). To be clear, the fact that Sam is self-absorbed and foolish is not a problem in itself. It's certainly not unearned--Terry and Janice react very badly when Sam comes out to them, and from other documents in the house it's clear that they've been neglectful and caught up in their own issues during what must have been a difficult and stressful year for Sam. And Sam has enough good qualities that behaving recklessly and thoughtlessly under the stress of almost losing Lonnie is understandable and even sympathetic. The problem is that Gone Home's format doesn't allow us to come to this nuanced conclusion about her in a way that isn't entirely unsatisfying. The game's power is rooted in planting the expectation that something horrible has happened to Sam, and then revealing that she is actually all right. If, like myself, you don't think that Sam (or Lonnie) are really that all right then you'll end the game feeling conflicted. It's a limitation of the interactive story format that having created this identification between the player and Katie, and encouraged the player's independence in exploring the house, the game then forces the player to feel what its designers think that Katie ought to be feeling--and unlike the game's success at eliciting fear at just the right moment, its attempt to elicit acceptance and happiness, in my case at least, didn't quite work. Despite this reservation, Gone Home is a very exciting piece of fiction, a fascinating exploration of the potential--and limitations--of interactive storytelling. If its designers haven't quite managed to get me on the right page, I'm still looking forward to what they do next, and to what other creators inspired by them do with the medium. Great review. My opinions on it were pretty much the same as yours. It's true, of course, that the Army legally has the power to jail her for desertion, but that would have been extremely rare in 1995 and would likely have been used only if she had gone on a crime spree or something. At worst, she'd have received an Other than Honorable Discharge and even that's unlikely. Even without bothering with legal representation, it's highly unlikely the Army would have bothered to jail some kid who didn't show up for basic. The U.S. has an all-volunteer military which isn't really interested in jailing people who don't want to be there. They've already wasted money on the kid: why throw good money after bad by going to the expense of imprisoning her? She's made it pretty clear she's not going to make a soldier. Definitely agree though that deserting was an incredibly stupid thing to do. Thanks for the information about Lonnie's likely fate. It makes the game's ending more palatable, though I wonder if either Sam or Lonnie could be expected to know this. And it still leaves the problem that Lonnie has essentially thrown away her life plan for a very uncertain future with Sam. As I say in the review, the game gestures at, but doesn't really answer, the question of why Lonnie wants to join the army in the first place, but having dedicated herself to that future, it leaves a very bad taste in my mouth that Lonnie would just sacrifice it for love. I don't think Sam or Lonnie would have known that, but they could have concluded (correctly) that the Army isn't going to mount a manhunt for her so they could expect she wouldn't get caught and pay any consequences. But I too don't like the character inconsistency. They created Lonnie as a character who seemed like she would make a good soldier and then decided at the last minute that she wouldn't. Given her youth, I don't find that implausible, but I do find it problematic. Would anybody have written such a plot where Lonnie was a heterosexual boy without considering what the act of desertion says about her character? * Spider and Web, by Andrew Plotkin: A mind-bending SF espionage mission. * Photopia, by Adam Cadre: I don't know how to describe this besides to say that it's mostly like playing out a bedtime story. ...mostly. * Violet, by Jeremy Freese: A humorous puzzle game, where you need to shut yourself off from distractions to work on your thesis. * Slouching Towards Bedlam, by Star Foster and Daniel Ravipinto: Steampunk London mystery. * The Dreamhold, by Andrew Plotkin: A puzzle game set in an imaginary castle; written with a great as-you-play tutorial to break into IF games. There's lots more terrific stuff, but these are all fairly welcoming to newcomers (most IF games take a lot of struggling with both puzzle challenges and with the IF parser; look to Emily Short for a wide range of terribly creative puzzle games, and other experimentations with the format). I used to play games like these as a kid and I did enjoy them, but these days I think I prefer my games to be more immersive. Part of the reason that Gone Home works so well is that it has the graphics and sound design to really put you in a spooky mansion in the middle of a stormy night, and the voice work is also excellent. I'll keep these games in mind, though, if I decide to branch out. Excellent review. Very specific and detailed, far beyond what I would have expected to read, and enjoy while doing so. I, myself, felt a discomfort and uneasiness as Robertson's voice faded and the credits showed up. I felt conflicted as a sense of accomplishment -- not only for me, but for my would-be-in-game-sister on her temporary triumph (which, however short may be, feels immensely good in it's importance) -- and desperation, in a way, I assume, a sibling would feel after discovering her young sister was misunderstood, hurting and clueless, and now is gone (had Katie just had the opportunity to listen and suggest comfort she might have helped her in any way). Like yourself, I didn't get the optimistic feel that everything is alright and dandy. Katie came back to a devastating situation. That was actually what made this "game" so intense in my experience. The discovery of complete new (or old) chapters in the family's lives. Things that really matter and change the way they'll live the rest of their lives. Sorry for the long comment. Good review! I used to play games like these as a kid and I did enjoy them, but these days I think I prefer my games to be more immersive. That's a somewhat peculiar stance from a book reviewer, but extremely common (and even understandable - I'm not criticizing here). I have kept up on the modern indie interactive fiction scene (e.g. I've played all of the games Standback recommended), so I was much less impressed with Gone Home as an exploration of interactive storytelling, since it really didn't do anything original for veterans of the IF scene and the story was a bit pedestrian. Certainly Spider and Web was much better and that game is now 15 years old. Still, it definitely wasn't a bad little game and, if I was a bit unimpressed with the story, I was quite impressed with the graphic design and evocation of the mid-90s. Yes, fair point - that even occurred to me as I was writing the comment. As you say, it's a common stance, and to me it has something to do with reading protocols - we expect realism from a movie, for example, but not from a play. Which doesn't mean I shouldn't be willing to try to expand those protocols, or try to develop new ones. Different expectations due to different life experiences, I suspect. There was a time when Infocom was computer games and I am old enough to remember that time. Review is great, and the game looks fascinating. I chose to read the review despite never having played it, because I doubt I'd have the time / enthusiasm for it nowadays.